I admit that I used to buy maybe one purse a year. I know... But thanks to blogs, the change in my sense of fashion and whatever else, I now have a bigger appreciation for bags. I change my bag out on most weekends, which would have been unheard of a few years ago. #'s 1 and 5 would be great for work. #'s 2 and 3 are Zara bags. Perfect colors. Perfect for the weekend. Perfect gifts, too I think. I imagine wearing #4 as a crossbody bag. I love saddle bags. I think they are perfect to wear while shopping or traveling. Would you like one of each, too? Hi Tiffany! I love handbags, my husband and closet will attest to that:) I love the saddle bag,so good looking with that rugged leather, its a beauty! Girl-you speak to my heart!! 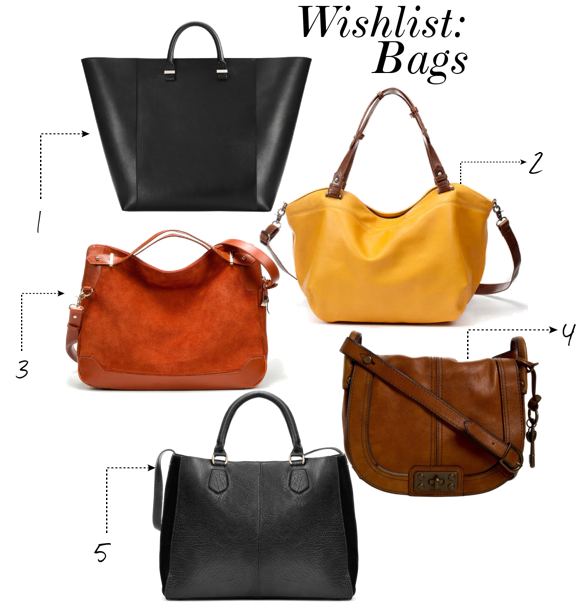 Love all of these bags. Love #4 and the shape and color of #2 is fantastic! loooove 2 and 3...sweet that they're from zara too! i love them all, but 1, 3, & 4 are my favorites! I am still on the hunt for a new bag - I have a slight obsession as well. Of course I love # 1, but I am a sucker for a saddle bag any day!